Congenital hypothyroidism is a condition caused by lack of thyroid hormones. This condition found in newborn infants. If left untreated, it may lead to severe complications including permanent intellectual disability or growth failure. Congenital Hypothyroidism: The deficiency of thyroid hormones in neonates and infants. Cretinism: Severe untreated congenital hypothyroidism resulting in short stature (dwarfism) and mental retardation. The congenital hypothyroidism is one of the most common preventable causes of intellectual disability (mental retardation). Hence, the early diagnosis and treatment are important to decrease the morbidity from this condition. The congenital hypothyroidism may occur as a result of an inborn error of the thyroid metabolism, iodine deficiency, or a structural defect in the thyroid gland. The thyroid gland develops from the fourth branchial pouch in the buccopharyngeal cavity during fourth to the tenth week of gestation. It later migrates towards the neck to rest at its anatomic position. An error in the migration or formation of the thyroid tissue (dysplasia, aplasia, or ectopy) may result in congenital hypothyroidism. Iodine is required for the production of thyroid hormones, triiodothyronine (T3) and thyroxine (T4), from the thyroid gland. Subsequently, a deficiency of iodine results in decreased production of thyroid hormones. In the United States, it is estimated that the annual incidence of congenital hypothyroidism is approximately 1 in 4000 births. The international data from different countries indicates the similar incidence i.e. approximately 1 in 3000–4000 births. However, the incidence is higher in some Middle East countries i.e. 1 in 1400–2000. The racial and gender preponderance has also been noted. The incidence is higher among Hispanic females. It also appears to be higher in females in comparison to males with a female-to-male ratio of 2:1. Twin births appear to have 12 times higher risk of developing the condition. Newborn infants with congenital hypothyroidism are usually born at normal gestational term or even post-term and may be initially asymptomatic as maternal hormones pass on to the fetus through the placenta. The babies often sleep excessively and rarely cry, and are labeled as “good babies”. In the United States and many countries of the Western world, the screening for congenital hypothyroidism is performed during the first week of life and most of the newborn infants are usually identified during this asymptomatic stage. A careful history and physical examination should be performed and testing should be repeated in order to confirm the diagnosis. Early diagnosis and treatment of congenital hypothyroidism are important to prevent the long-term mental disability from this condition as thyroid hormones are crucial for normal growth and maturation of the brain. Technetium-99m or iodine-123 may be useful in determining the cause of hypothyroidism. Ectopic thyroid may be demonstrated by thyroid scans. Ultrasonography may be used as an alternative to thyroid scans. Early diagnosis of the condition is very important for management. Medical treatment involves thyroid hormone replacement (oral levothyroxine is used). In endemic areas where iodine deficiency is common, dietary iodide supplementation is advised and may help in preventing the condition. The prognosis is excellent if timely treated. Most of the children achieve normal physical and mental growth. Regular follow-ups and blood thyroid hormone measurements are needed for optimum management. 1. A 9-week-old female newborn infant, who was born at home, is brought to the pediatrician by her mother. This is because she noticed that: she always feels cold, she sleeps too much, and her bowel movements are not very frequent. 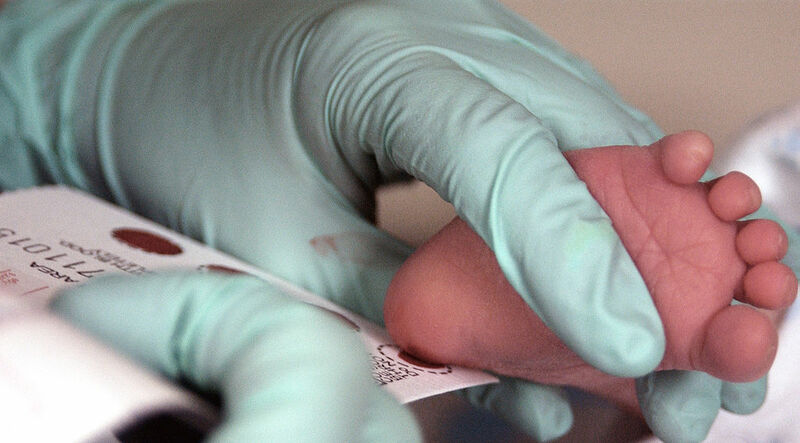 By physical examination, the pediatrician finds mild jaundice and hypotonia. Which of the following lab findings would you expect to see in this newborn? 2. 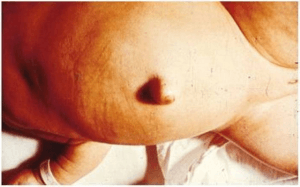 An obstetrician who works in a developing country delivers a baby who is suspected to have congenital hypothyroidism due to maternal iodine deficiency. 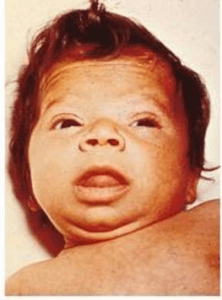 Which sign of the following would you NOT expect to find in this newborn? 3. A 7-week-old American infant was born at term, following a normal and uncomplicated pregnancy. His chart reveals that he had indirect hyperbilirubinemia at birth. According to his mother, he suffers from poor feeding. By physical examination, you notice that he suffers from hypotonia, lethargy, coarse facial features, and a protruding large tongue. What is the most likely cause of his presentation? Maala S Daniel. Congenital Hypothyroidism. Medscape.